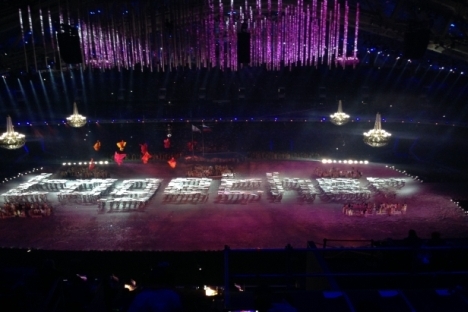 Paralympic opening events show that Russia has come a long way, even if there is still far to go. It takes something special to make a hulking icebreaker look graceful, but the Mir managed it. Hanging from wires, the vast model ship cruised through Sochi’s Fisht Olympic Stadium on March 7, sailing through sheets of imitation ice waved by volunteers. The Paralympic Games are all about removing barriers between people, and Friday’s opening ceremony, entitled “Breaking the Ice,” epitomized it beautifully. The nuclear-powered icebreaker, a Soviet image if there ever was one, repurposed for a changing world, the Mir perfectly encapsulated the concept behind Russia’s first Paralympics. Much like the icebreaker, Russia is vast and can be slow to change direction, but when they do, both can be devastatingly effective. In 1980, the Soviet government hosted the Olympics in Moscow but turned down the chance to take on the Paralympics too. “There are no invalids in the USSR!” a Soviet official is said to have ranted when asked why. As International Paralympic Committee president Sir Philip Craven noted at the Sochi opening ceremony on Friday, that tale of refusal highlights how much Russia has changed in the 34 years since then. In 1980, Craven said, “the prospect of Russia staging its first Paralympic Games was nothing but a dream. But dreams do come true, and since winning the Games seven years ago, this part of Russia has undergone a monumental transformation. However, the biggest transformation for this country is still yet to come. The Russian government has spent millions to make Sochi (or at least the parts of it near the Olympic venues) as easy as possible for disabled people to navigate. In a stark contrast to the concrete blocks that make up many Russian cities, in Sochi ramps, tactile surfaces and accessible entrances abound. Updating the infrastructure has been relatively straightforward, if not cheap, but updating people’s attitudes takes a little longer. One example: a disabled journalist covering the Olympics was quoted as saying he has had no problems with the wheelchair lifts on the ubiquitous media buses, except for often having to show the drivers how to use them. The “barrier-free” concept of Sochi construction may not yet be replicated across Russia, but some of the ideas behind it are at least starting to migrate, helped by the spread online of an “accessibility map” where disabled people across the country can mark accessible buildings to help one another navigate, an official part of the Paralympic legacy plans. The 180 hours of coverage of the Paralympics on Russian TV, compared to negligible live broadcasts of previous Games, means that Russians are seeing disabled people as capable individuals, rather than “invalids,” the typical Russian term – people to be pitied, shut up in institutions or their own flats. Now, the image is of people like Roman Petushkov, who has said he was made to feel “like something that has been thrown away” after losing both legs in a 2006 accident, as friends and relatives gathered round his hospital bed as if at a funeral. Petushkov took up cross-country skiing later that year and became Russia’s first hero of the Sochi Paralympics, with two gold medals to date and a personal message of congratulation from President Vladimir Putin. Just how far Russia has come is illustrated by the story of NadezhdaAndreeva, a stocky mother-of-one with a mischievous smile from the industrial city of Tolyatti. When she was born with one leg in 1975, five years before the Soviet Paralympics-that-weren’t, doctors took what must have seemed the easy way out. They told Andreeva’s parents that she had died. Raised in an orphanage, Andreeva believed she was alone in the world until the age of 18, when a bureaucratic snafu over accommodation turned up a note in her file relating to her parents. After an emotional reunion, her parents took her in. Seventeen years later, Andreeva is in Sochi competing in biathlon and cross-country skiing. Her first race Sunday was something of a disappointment as the wrong choice of ski left her trailing in 15th. Still, as someone who has experienced the worst and best of Russia’s relationship with disabled people, Andreeva was optimistic about her hopes for the rest of the Paralympics. “Nothing’s lost yet. We’ll keep trying,” she said.